An image taken from the International Space Station on August 31 shows then-Hurricane Katia churning in the Atlantic Ocean. The International Space Station's three astronauts may need to take shelter Wednesday morning because of approaching debris, NASA said Tuesday. 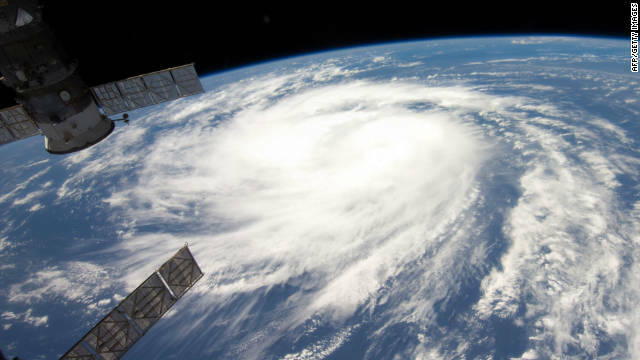 The debris, a 4-inch piece of a weather satellite that China destroyed with a missile in 2007, is expected to pass within 2,800 feet of the space station at 4:43 a.m. ET Wednesday, NASA said. An impact could damage the space station, and NASA said that distance is too close for comfort. If the prediction holds into Tuesday night, Cmdr. Dan Burbank and flight engineers Anton Shkaplerov and Anatoly Ivanishin will spend several hours sealing the station’s hatches. NASA will make the final call at 4 a.m. ET on whether to move the three-member crew in the space station into a docked Soyuz spacecraft, NASA said. NASA Television and NASA’s website would begin showing the shelter operation at 4:35 a.m.
Burbank, Shkaplerov and Ivanishin arrived at the space station just last week. The previous crew left the station Monday and landed in Kazakhstan on Tuesday. Monday’s departure of the previous crew slightly changed the station’s orbit, making a Wednesday collision with the debris possible, NASA said. “The object had been monitored earlier but was not then a threat,” NASA said on its website. The debris is a piece of a Chinese Fengyun weather satellite, NASA said. In January 2007, China used a land-based missile to destroy the 2,200-pound object, leaving more than 150,000 pieces of debris orbiting above Earth, NASA estimated. The space station has had several close calls with space debris. In June 2011, an object came about 1,100 feet from the station, prompted the six astronauts aboard to take shelter inside two Soyuz capsules. In March 2009, a chunk of metal - about 5 inches across, and moving at nearly 20,000 mph - passed within three miles of the station, prompting the three-member crew into the Soyuz return ship for about 10 minutes, NASA said. The debris came from a satellite rocket motor used on an earlier space mission, NASA said. It is really a nice and useful piece of information. I'm glad that you shared this helpful info with us. Please stay us up to date like this. Thanks for sharing.